From middle age onwards, most of us begin to feel the effects of gravity as if it was an enemy – our spine and joints compress and we become less flexible. 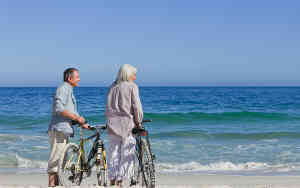 With the ageing process, it is easy to find that life becomes more difficult in small unexpected ways. Simple daily activities like getting in and out of a chair, walking up and down stairs, carrying things, reaching for a high shelf or gardening are not as easy as they once were and we become more prone to chronic aches and pains. For the older person, balance and fear of falling becomes an issue. The physical demands that we take for granted become more difficult as we get older and that is where people need all the help that they can get. Alexander help is particularly appreciated here. Lessons in the Alexander Technique are gentle and carried out on a one-to–one basis. They help people to stay active. They help restore flexibility, balance and range of movement. Most people, over a series of sessions, find that they begin to move in a more youthful way, which improves confidence and their attitude to the ageing process often becomes more optimistic. No special aptitude or clothing is required. Joan Bakewell, 79, Government Tsar for Older People. BBC Radio 4 Woman’s Hour 12 June 2012 – Elisabeth Walker, age 97, interviewed. The Guardian March 16 2006 – Jeanne Day, aged 80, interviewed.